This weekend hopes for weather less violent as March digs into its place for 2014. At the Meadowlands this Saturday, March 8, we will see the first wave of sophomore pacers in the William Gilmour Memorial Final for $60,500 and three- and four-year-old trotters in the Charles Singer for $53,200. That’s as high as it is getting so far in the features department. We continue to pick and choose a few specific races from common cards where we hope to keep up with our success of presenting some strongly priced winners. We love the Meadows and we are there again this Friday, March 7, to discuss a few races at length for optimum value wagering. More horses to watch (H2W) at the Meadows and for overnight events throughout the TwinSpires harness menu are presented exclusively below. This list provides wins, places, shows and exactas every week, featuring contenders that, for the most part, the public dismisses. 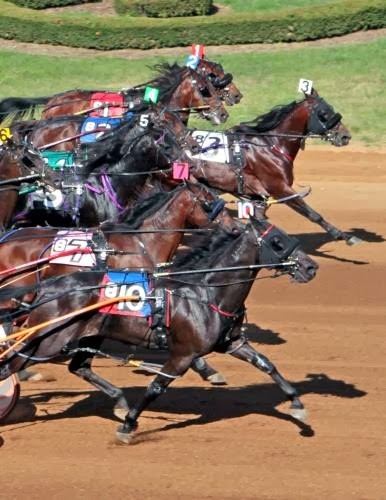 We have added harness racing’s newest track, Miami Valley, in Ohio and have already resulted in successful plays. Saratoga opens again and is also added. Please note that horses from our featured overnight events the week before appear on the H2W list as second-time members if they did not win when we highlighted their previous race. Sophomore pacers that we may not see again down the stakes road are led by the obvious Dinner At The Met in the William Gilmour Memorial Final. Jimmy Takter trains three here, which could upset the betting configuration (program unavailable at press time) but we have to watch for value from National Debt. He is looking for his second win in as many tries and could be the speed of the speed, certainly if he commands his inside post and rates the quarters. Let the price be worth it by your judgment but he could be a strong third choice with “Met” and Capital Account leading the support bank. With Time To Quit perfect with five wins in this Charles Singer series, coming into the final from the inside is going to make you think twice about playing at all. Just behind him, Perfect Alliance is four for four this year and then you have most of the horses they have beaten between them to fill out the field. So, a very light endorsement is handed to Clementine Dream, who is the most competitive past the top two and is bound to be a price from post 8. Trainer Mark Harder also has Ray Hall from post 4 and if they are coupled (no programs available at press time) you need not worry about making a decision. A horse (Goggles Paisano) we chose second in a would-be giant exacta last week, in which we nabbed the 15-1 winner (Pop Cop), surfaces the morning-line (ML) choice stepping down into this conditioned pace. However, another horse, Brown Titan, is here with an unreasonable 12-1 ML and stands the best chance to blow this field away. Hanged for three calls dropping to this level last week, Brown Titan hails from Northfield, where he collected checks in Open company. Those foes were better than these, further strengthening our support for him here. For exotic plays, be sure to use Incredible Dragon, who has shown spark at this level and is sitting on a big mile in his fourth start after a brief rest. This conditioned trot is no conundrum, considering obvious choices are marked with short ML odds and have inside posts that fans love to count on when betting. But on the outside, post 9 (scored on the far outside at the Meadows), RT USS Chilton steps up a slight notch and may overcome a trip scorned by his post and win at a big price. As a legitimate contender, “Chilton” has won two of three, the middle loss of the trio due to breaking stride, mostly. He has a dual style, so if he manages to have to go with the outer flow due to his post, he should be flying in the stretch. Consider, also, that the ML choice is also a stepper-upper with two of three wins but Connie Keeper has post 2, so the inequality is based upon post as well as raw speed data, which is fine to ignore. Use her in exotics, though.